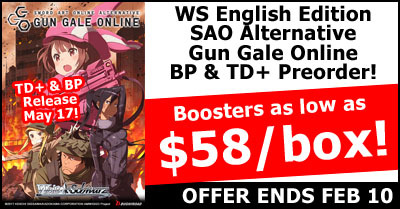 This is a PRE-PAID LIMITED pre-order for the WeiB Schwarz Sword Art Online Alternative Gun Gale Online English Edition Booster and Trial Deck Plus. Pre-order period for this item ends at 10 PM on Sunday, February 10th. Release date is May 17 2019. Pre-Orders cannot be cancelled.